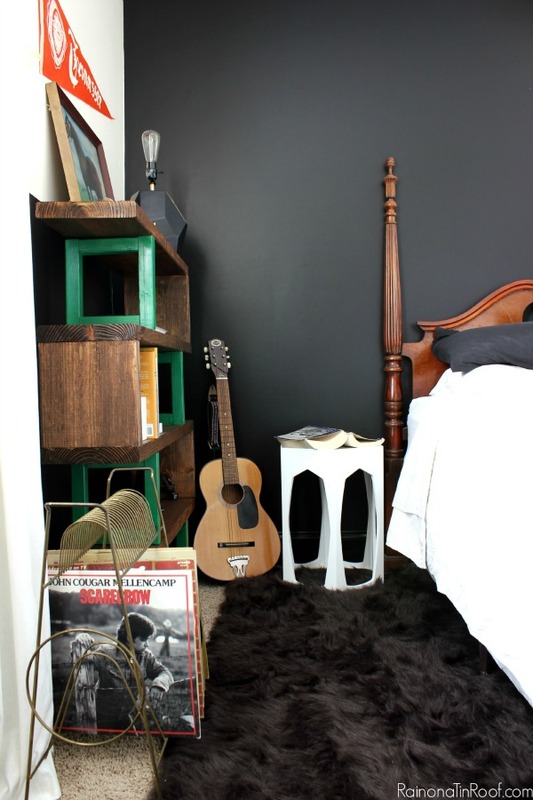 How many uses can you find for one average sized bedroom? Well around here, we can find three. Apparently, we like a challenge. I thought that as kids got older, they liked to spend more time with their friends – away from the adults in their lives. Or either Bill is the exception. It seems the older he gets, the more he’s here. I’m not complaining – I’ll take all the quality time I can get; he’s off to college next year. While Elvis loved his jungle room, apparently Bill was not fond of a similar theme with the leopard print wall in his room. I was also invading part of his space with my office area. So I told him he could decide what he wanted to do with the room. I know – I couldn’t believe I uttered those words myself. The only conditions were that it did still have to have the bed, as the room is also our only guest room, and my desk had to stay in the space. Anything else was up to him. I set him up on Pinterest one night – and held my breath. I prayed he wouldn’t pin some hideous basketball/baseball/football/soccer ball border circa 1992. I cringed as he looked at bright orange Tennessee Vols decor. I finally had to leave the room. 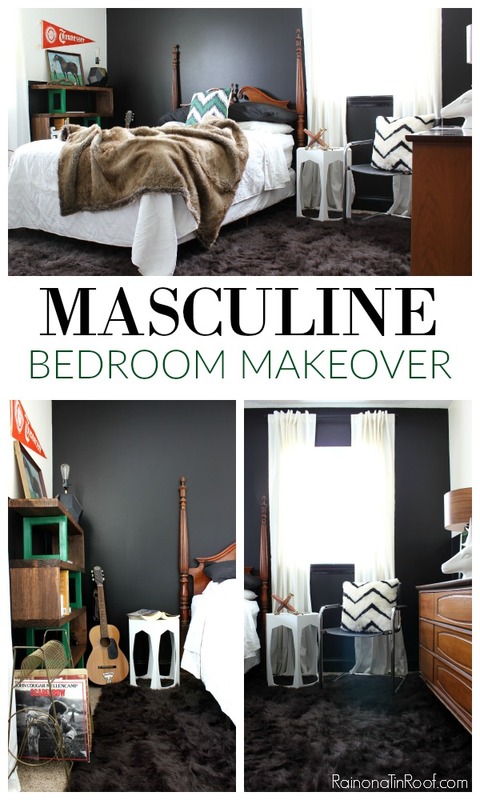 About 30 minutes into his browsing, he called me back in and presented me with his pick – a masculine black and white room with fur accents and wood tones. I don’t know if I was ever more proud of him. I really don’t know who was more excited about how well it turned out – me or him. It is perfect for him, it works just fine for guests and my office space is still in the room – just out of the way. *A big thanks to Home Decorators Collection for helping with this project so Bill can have a bedroom that doesn’t resemble the jungle room. 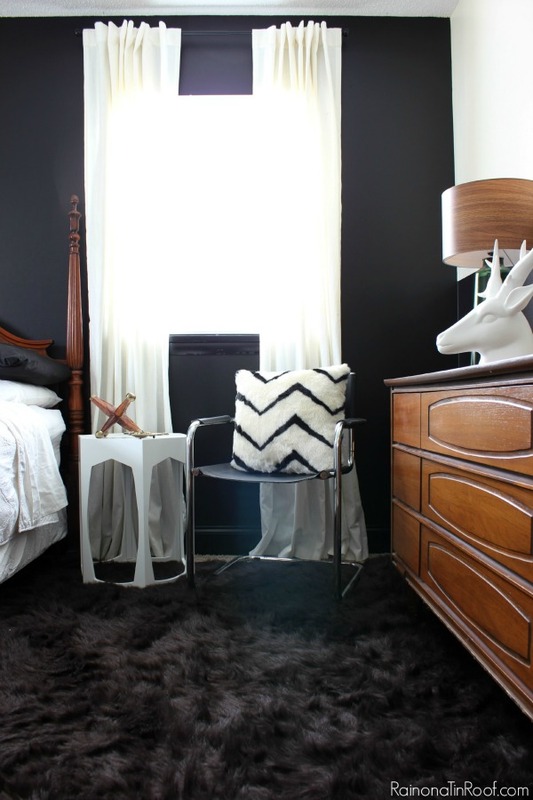 We definitely wanted black in the room, but didn’t want the entire room to be black. 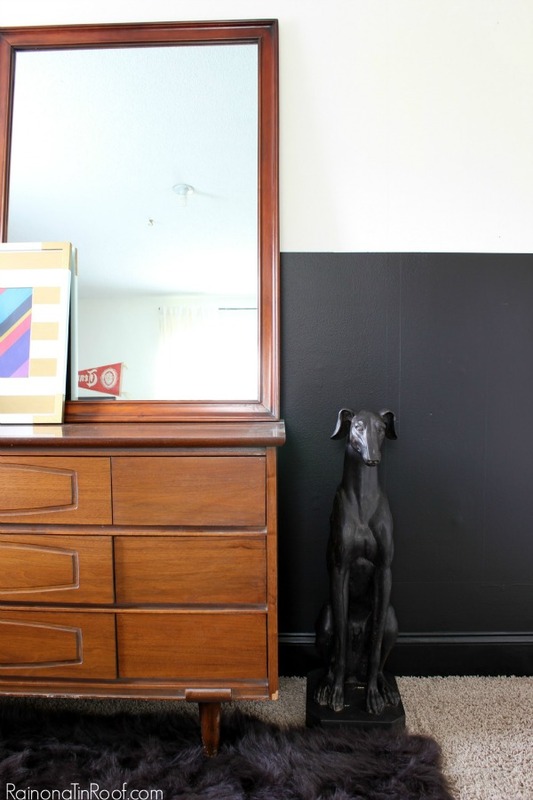 We opted to paint one wall completely black and then paint black halfway up on two of the walls. The bed stayed, however I removed the rails and added feet to the box spring – it was ridiculously easy. It really helped to open up the room. 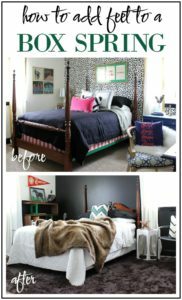 I also think it makes the headboard really stand out against the black walls – I love that wood grain against the black wall. 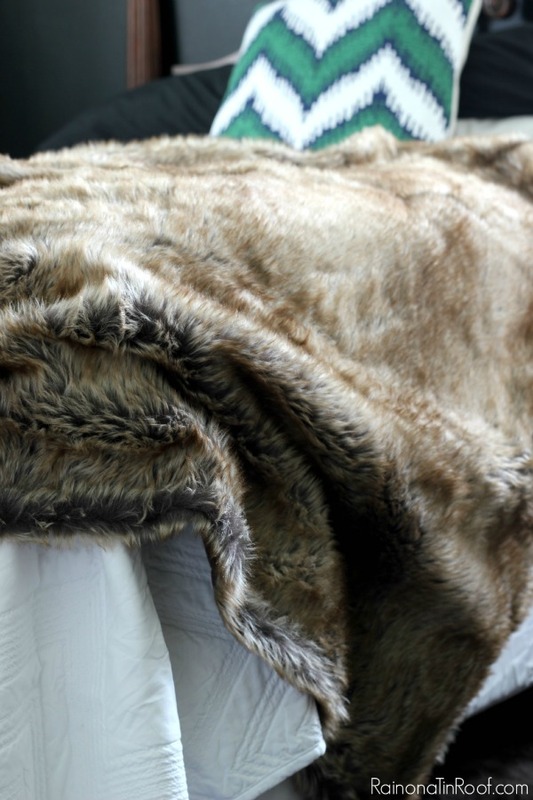 We opted for a white quilt on the bed, accented with a super soft and cozy faux fur throw and a green accent pillow. Most of the time, he totally ditches the quilt and sleeps with the fur throw. He. Loves. it. My desk used to be on the wall coming right into the room – it was way too overwhelming there though. We moved it to another wall and found a vintage mid-century modern dresser to place along the wall for some much needed storage. 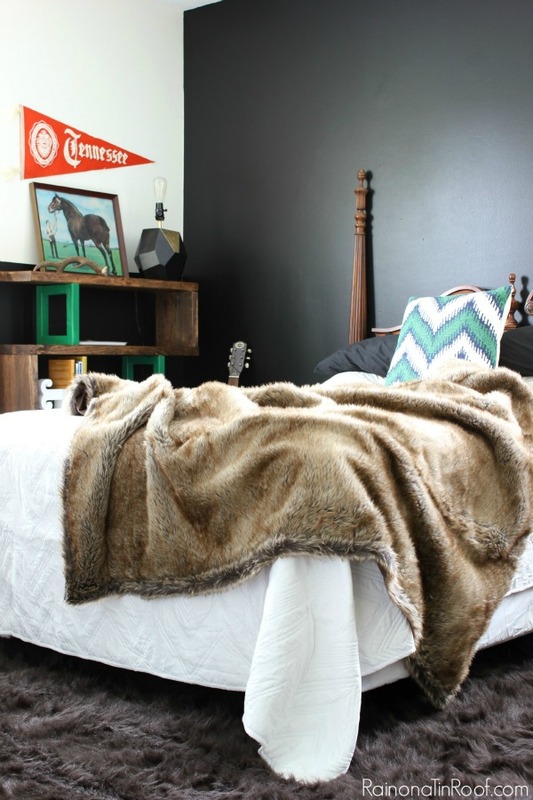 A chocolate faux fur rug from Home Decorators Collection covers most of the carpet in the room. The rug was a steal of a deal. I got an 8 x 11 for under $300. When Bill came home and saw it for the first time, he immediately laid down on it and hardly moved for the rest of the night. We did keep the chrome and black chair in there, but got smaller side tables for each side of the bed. 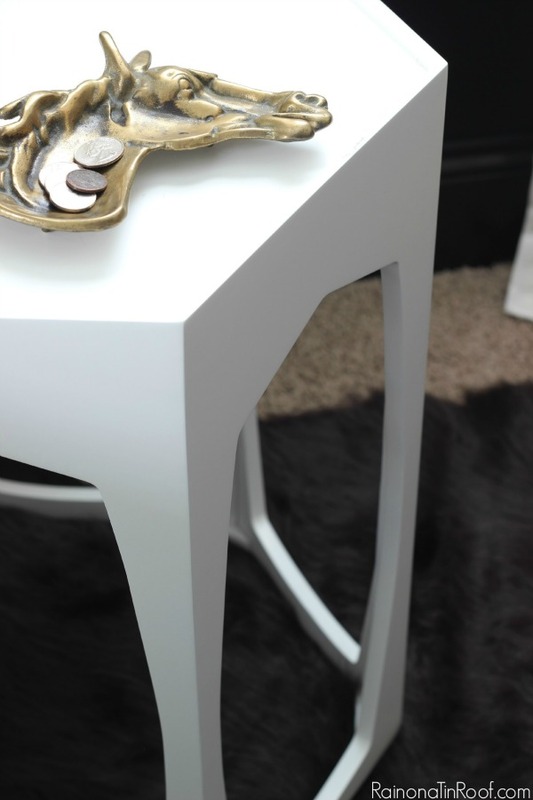 The tables have open geometric shapes on the sides, so they are very airy feeling, which is great for small spaces. There is still plenty of room though to hold knick-knacks on the top. He picked out the dresser himself (we found it at a local vintage shop). I pulled the mirror that actually goes with mine and Grunt Labor’s bedroom set out of storage to prop on his dresser. He fell in love with Finneman the dog as soon as he saw him. 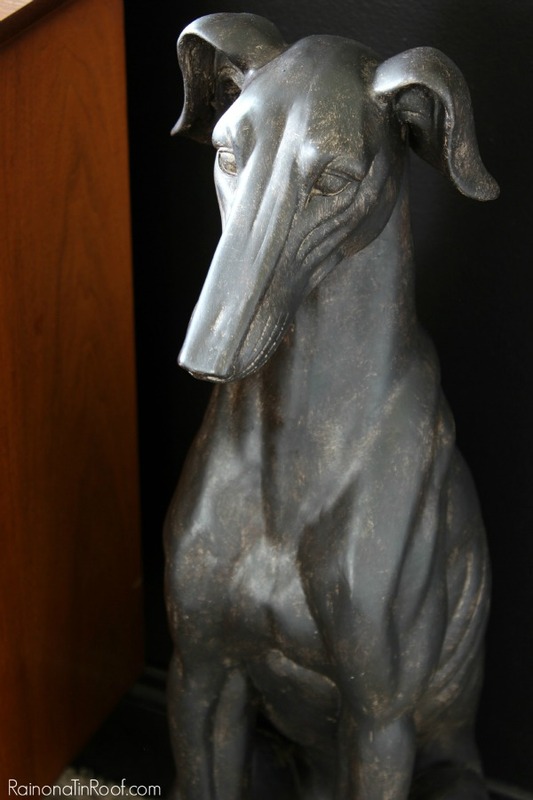 He didn’t really have to convince me – I thought putting the dog in a bedroom rather than as the typical entry decor was a genius idea. However, if you follow me on Instagram, you may have seen that the Circus has tried to make the dog her own. She’s drug him all around the house and adorned him in hair of tinsel, a ballerina costume and most recently a combination of items that make him look like he’s a cross between an Egyptian pharaoh and a Disney princess. The art and deer head on the dresser was in the room before, it still worked pretty well with the space, however we did add in a green glass lamp that I wouldn’t mind stealing for my own room. 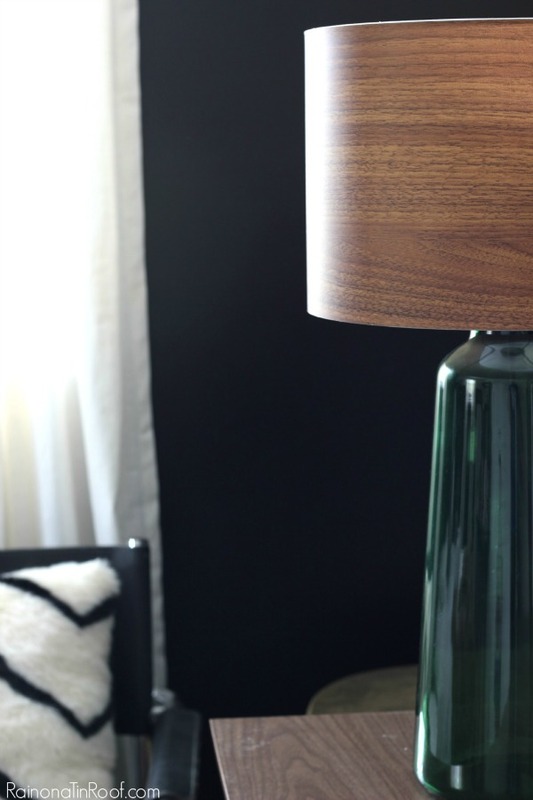 I also love the shade on this lamp – it’s a woodgrain look that goes great against the black and white wall. The other side of the bed may be my favorite part of the room though. Bill and I made, (yes we made!) a bookshelf for this wall. The full tutorial for the bookshelf is here. 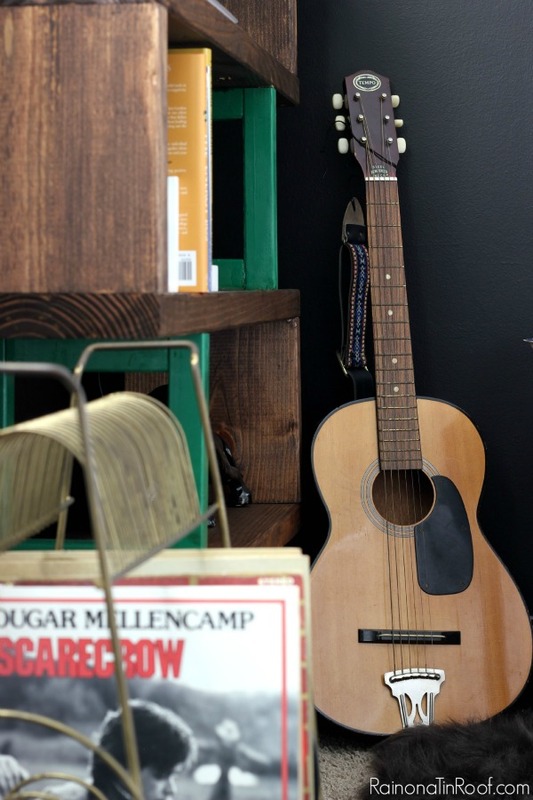 We decorated with some vintage items around it – including my grandmother’s guitar which he thought was a pretty cool touch. The other occasional table is on this side as well. And finally, on the wall opposite from everything else is my workspace. It’s tucked away from everything else and I also kept this wall entirely white to visually separate the two spaces. I’m one smart cookie, right? 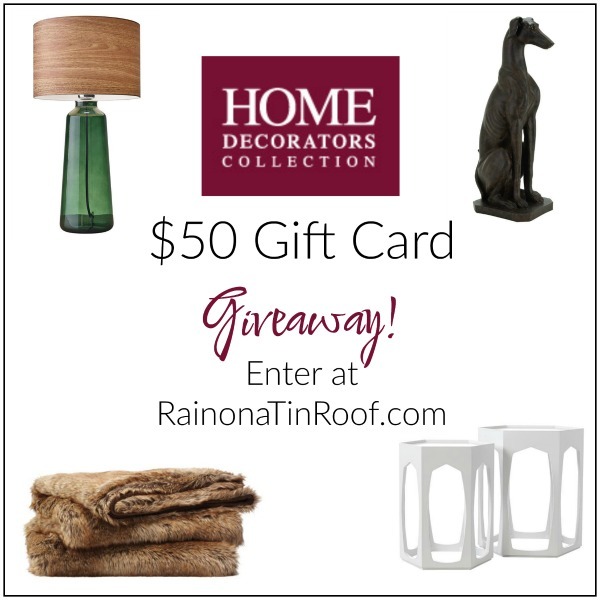 And…Home Decorators Collection is giving away a $50 gift card to one lucky guy or gal! Disclosure: This post was a collaboration with Home Decorators Collection. However, all opinions and pride in the teenager’s design skills are 100% mine. This turned out so well, Jenna! Kudos to Bill for his awesome choices! 🙂 Love it all! Thanks, Abby! I love it too – and so does he! He did a great job! I’m so freaking proud, Sonya!! haha! I love how it turned out. What a great room. Thank you, Marty! It was a really fun project! It looks amazing. If I’d win, I’d love to get some holiday décor like the tabletop fir tree. You hit it right on! Gorgeous room. I would get the Armstrong Desk Lamp for my daughter. Thanks, Alina! I think it turned out pretty great too. And I love that lamp!! You may have a future designer on your hands, it is awesome! Thanks, Kristin! He did a great job! Girl, from your lips to God’s ears on the magazine feature! haha!! There’s no doubt in my mind he’d let you hire him! haha! I love this room!! It’s perfect. 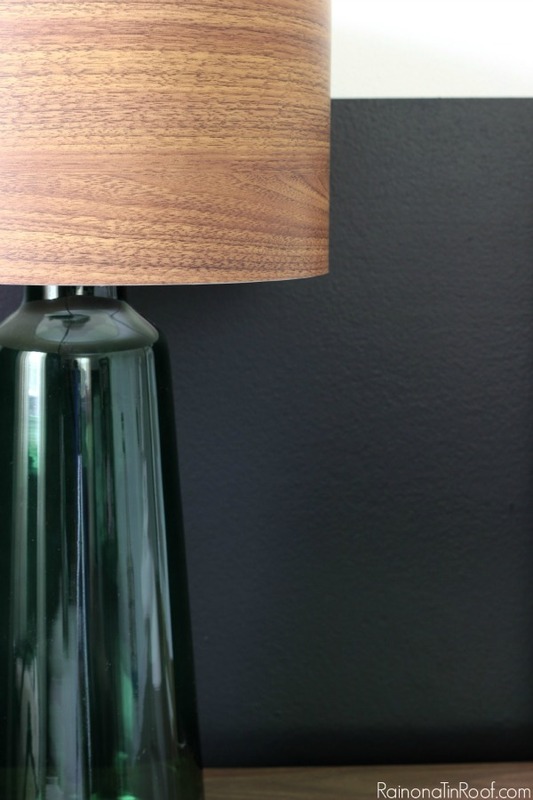 I love the black and wood together, and that green lamp of course! Thanks, Meg! I know – isn’t that lamp great?! It really turned out great! Love all the touches! Great job on the bookshelf!!! Thanks, Lindsay! The bookshelf is really easy to make – can’t wait to share the details on it! I love what all you guys did with the room. I applaud his choices – nicely done. I applaud you for letting him loose with Pinterest. Isn’t it funny how guys can find their way through that madness and come up with some focused/good ideas? I sure wish I had that talent. I have found that my older son is sticking around the house more and more. It’s not as if we are party animals. I think maybe he just likes us. Whatever it is, I’ll take it. I have three semesters left before he graduates and it is slipping away too quickly. Thanks for the awesome giveaway. We just redid our guest bathroom so I would put the GC to good use for bathroom decor. 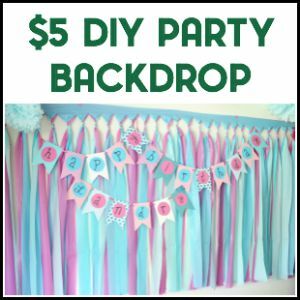 I was shocked he made it through a Pinterest session – I usually get overwhelmed on there myself! I’m with you – I’ll take as much time as I can get! Isn’t that dog awesome, Debra?! I really wouldn’t mind another one for somewhere else in the house! Jenna, got bump you a minute…. Bill, duuudddeeeeeee, you freaking rocked this room! I love the black and the wood! And Finneman, he will be an awesome pet for a college student too! Be sure to hijack him on your way to college! Now you taste in furniture…..you rocked that dresser man! I believe if you don’t do football, just sign on to be Jenna’s understudy in her crazy world. You have a huge heads up anyway. Just as a fall back on career. Jenna, Bill, I know has made you so proud! Keep Rockin them kids cause your getting that right girl! He read this last night, Hope and smiled the whole time! 🙂 Now, quit telling him to take Finneman with him – I love that thing too! This makeover turned out awesome! Great job, and I am so impressed that a young guy helped come up with this design! He has good taste. He does have good taste, doesn’t he, Erin? Thanks! Thanks, Pam! I know – I love that dresser too. We got a great deal on it as well! I am in love with the Iron Boot Planter! would really look great in my living room.. I would get the Director Floorlamp in black. They have really nice pieces. Thanks, Diane – he did a great job! I would love the Terracotta Bread Form, I bake all my bread. Our family is gluten free! I like the kyler lamp for my bedroom. So many nice things to choose from. 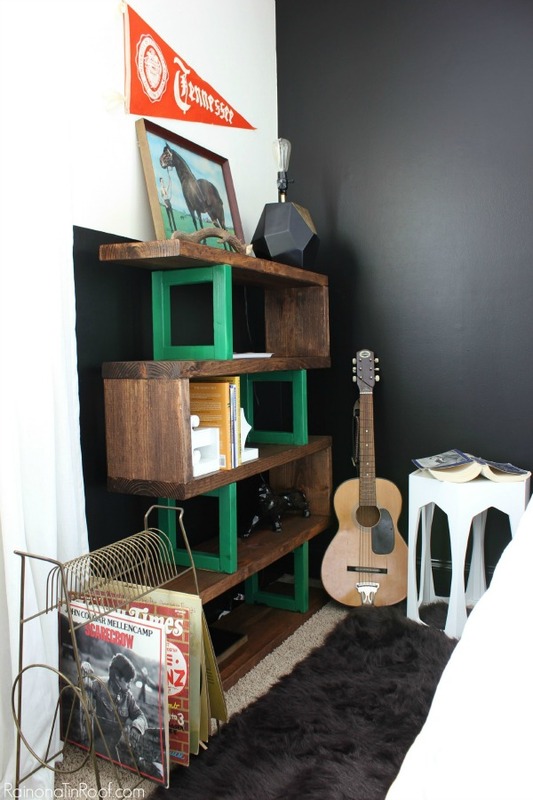 The room looks great, love the black wall and I have to have a bookshelf like this one….beautiful. Thanks, Terri! 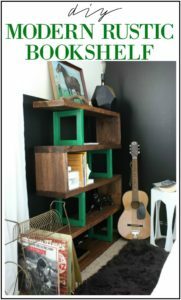 That bookshelf is REALLY easy to make! I can’t wait to show you guys how! I would buy the square Huge Clock! Love it! I’m so happy to have made Bill smile! I did forget to tell you that green lamp is lucious! Drool worthy really! Now for the Finneman debate: it’s really not fair for HIM to wear “girly” things at all. And I’ll bet if the circus ???????? can get to and use pink nail polish well, Finneman will never be the same! It’s not something he will ever recover from! ???? And I know that Finneman is your kind of dog Jenna! (Being as you luv them so much……) can we make a deal: Bill keeps Finneman and you and the circus get a Fiona? Fiona?! hahahaha!!! This might could work! I love how you came up with this!! That looks fantastic! 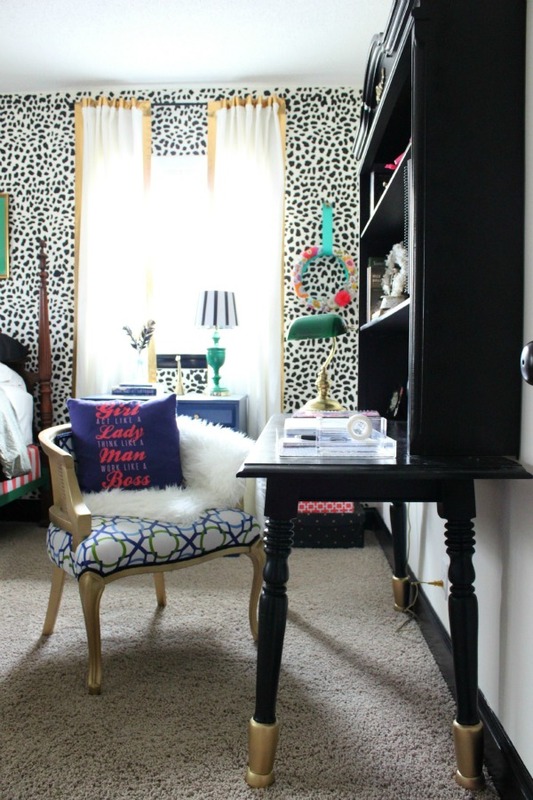 I am in need of some new throw pillows and I love the velvet studded pillows they have. I would choose the Martha Stewart Living™ Mini Glitter Ornaments. Super cute! And FANCY was her name! HA! I could roll around on that cozy rug, too! You and Bill make some awesome choices! I couldn’t help noticing the John Cougar Mellencamp album! OMG, Jane – that rug!!! He was so funny when he first saw it! And I love JCM – I’m trying to inflict this love upon Bill as well! haha! 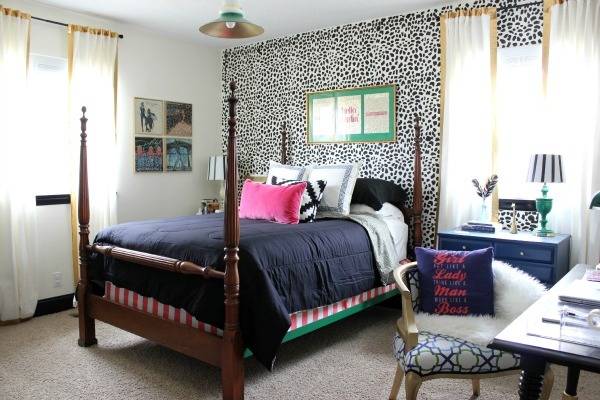 Jenna, it is so fun to see a new room “after” redesign. As you know, I loved the room before the makeover, but I have to say that I like it just as much now. It is fabulous!!! I am already placing many of the items on my wish list. 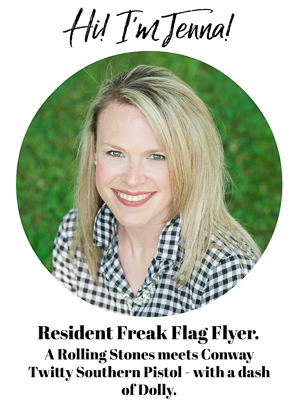 Way to go, again, girl! Thank you, Paige! Yea, I didn’t hate the room before, but it definitely wasn’t meant for a 17 year old boy! haha! I actually might like it more now though! haha! The redesign looks great! I would get the Vivien Area Rug in Grey to compliment my modern décor with transitional modern/classic piece. Thanks! Thanks! I love that rug! I am obsessed with the Diamond Mirror! It is so chic! Your room looks awesome. I need some sort of storage device in my room to get it all organized. I’d buy a new outdoor rug like the WHIRL ALL-WEATHER RUG. Thanks, Heather! 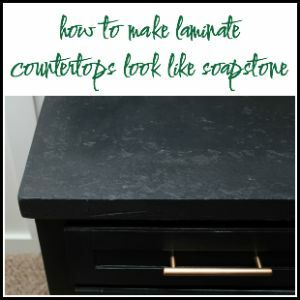 I love that lamp as well – I swoon every time! Love Bill’s taste! Room looks great! I love the unique bookcase and both lamps. Thanks, Joni!! I am so proud of us for tackling that bookcase! I don’t know if I’ve said it before but I love that fluffy rug. It is sooooo soft!! Love it! I love the MANCHESTER SIDEBOARD. Thanks, Sarah! Yep, he did a great job! The World Tapestry Decorative Pillows would look super fabulous at my house! It is absolutely incredible, Jenna! I love how it represents and suits him but it also fits really well with your aesthetic. Amazing details. And I have my fingers crossed about this giveaway!! Thanks for the chance! Thanks, Krista! 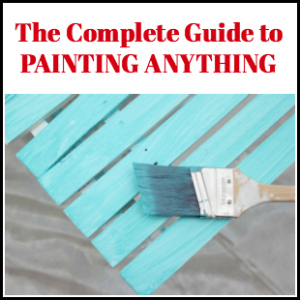 Yes – it is perfect for him and works great with the rest of the house as well! Good luck! I would love the Celeste Embroidered Pillow! I kinda want a ‘fur’ throw for my bed now, but then I realize it would be just another thing the cats would claim as their own. So I’d pick the Oxford Tall Secretary. I would buy the Tracie Basic Leather ottoman. Wow that bedroom looks awesome! Great job! I love the Monogram Wooden Wine Trough. I would buy the Maribel Table Lamp. I would put it toward the Camilla’s Vanity. The Room Makeover turned out great. I really like the Sawyer Area Rug – this would be perfect for the bedroom. I love how you decorated the room, especially with the chocolate rug! I’d get the A Map of the World Tapestry for our office. I like the Martha Stewart Living Enchanted Winter Collection. This would help at getting this. Great decorating!! I like the game set that I spotted, that would be a nice gift! Such a great makeover- awesome job! I also love the Soho Delfino 48″W Storage Bench. Masculine but still Jenna! Perfect! I think so too, Jen! Thanks! Love what you all did here! 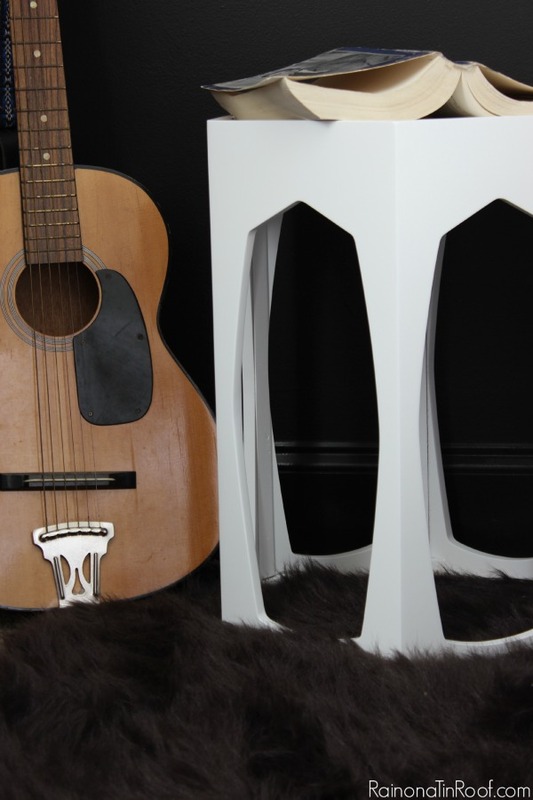 That wooden shelf is genius! nicely done! Thanks, Carli! That shelf is one of my favorite things I’ve ever done!